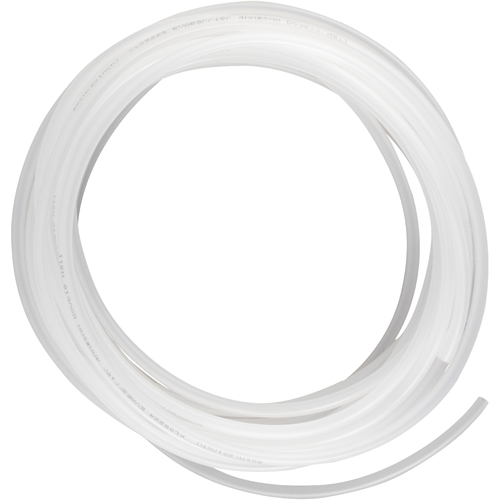 If you're looking for a high-quality draft tubing to take your system into the 21st century, EVABarrier is the clear choice. This double walled tubing offers superior protection against oxidation, CO2 loss and microbial growth. Plus, it's BPA and PVC free! EVA tubing is the future of draft line for professional applications, and now you can rig up your home system with the same first-class tubing. The 4 mm (5/32") ID size is perfect for homebrew draft applications where only a short beer line is needed. We recommend using 5-6 ft. per line for adequate flow resistance. The outer barrier is made from EVA material and provides a decent stiffness to the tubing while still remaining pliable. This not only makes EVABarrier extremely kink resistant, it also makes it the best tubing to be used with Duotight, John Guest, and other push-in fittings. The inner barrier is made from a proprietary polymer that acts as an excellent gas barrier. You can rest assured that your beer will be better protected from oxygen exposure, as well as CO2 loss. Your beer will stay fresher for longer and not loose carbonation like with other draft line. With other beverage line, you may notice that beer sitting in the line for an extended period will start to taste flat and/or oxidized. EVA Barrier tubing is unquestionably better in this regard and you will notice a significantly improved freshness of your beer, especially if it's been sitting in the lines for a while. Due to the high density and smooth nature of the EVABarrier inner wall, the internal surface of the tubing is remarkably smooth and almost completely impermeable. This makes it difficult for bacteria and other microbes to attach to the inside surface of the tubing. Just another way EVABarrier is looking out for you and your beer!